We are very happy to announce the release of Zerynth r2.2.0. This newest release supports our partner’s Bridgetek BT81x family of graphics controllers. The same controllers that power the new range of Riverdi displays, also a partner of ours. Other than this, Zerynth r2.2.0 brings numerous other features, libraries, enhancements, and optimizations. As we said, the Bridgetek BT81x series of Embedded Video Engines (EVE) is officially supported with the Zerynth r2.2.0 release. This chip family utilizes an object-oriented methodology for creating hi-quality human-machine interfaces (HMIs). Refer to the official doc for more info. 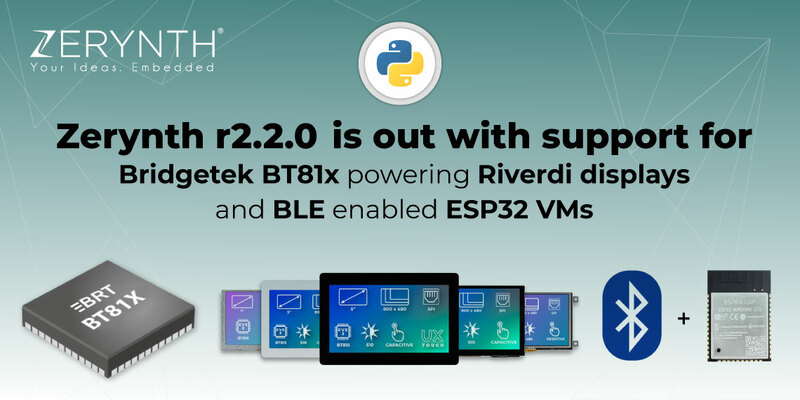 Furthermore, BT81x graphics controllers power the new generation of Riverdi smart displays. Those display modules are high-quality cost-effective displays for use in consumer or industrial applications. Please refer to the official doc for more info. A BLE driver for all ESP32 devices is now available. It includes support for secure pairing and scanning; Refer to the official doc for more info about this module and its example of usage. The BLE driver is also compatible with the W-Fi and Ethernet drivers; the radio coexistence is entirely managed by the VM in a balanced mode. You can now easily manage BLE on ESP32 in simple Python! Virtual Machines for all ESP32 devices have been updated to the official Espressif IDF-3.2 version. This update improves the performance with a lot of enhancements and bug fixes including the new Watchdog management for Secure Firmware VMs. Lastly, you can now use a 64bit integer and double floating point directly from your Python Scripts. Check new functionalities of the Wolkabout library in order to better connect every Zerynth supported devices to their Cloud services. Refer to this link for more info. Perhaps you already know this, but Wolkabout is one of our partners, and we have various tutorials and how-to guides on connecting Zerynth supported devices to their Cloud service. For example, this remote weather station tutorial. Warning: once r2.2.0 has been installed, older versions are no more compatible. We suggest always to keep Zerynth Studio up to date, but if you want to work with older versions, you can remove and re-install Zerynth Studio from scratch selecting the version you prefer. As usual, if you have any issues about this update keep us updated on the Community Forum! That way, we’ll solve the issue as fast as possible. And if you have any ideas for projects, examples, applications, and how-tos, don’t hesitate to post them on our Hackster page.